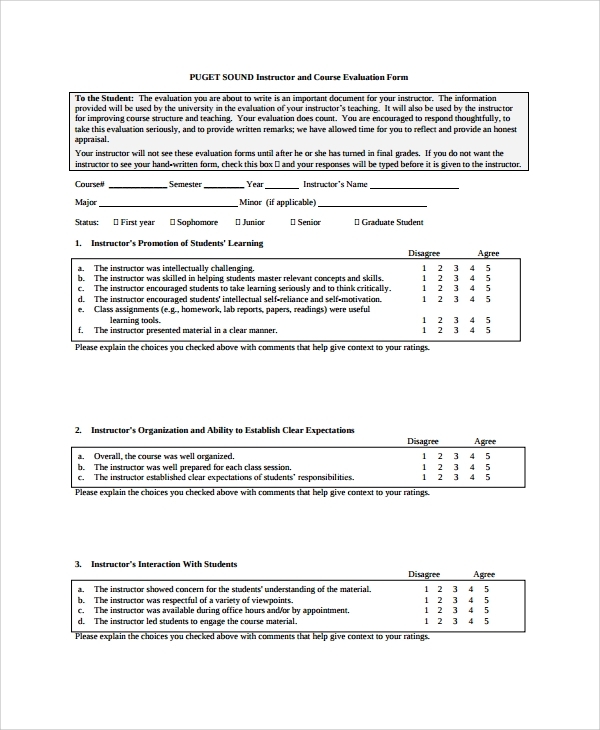 The purpose of the class evaluation is to survey and grade the academic performance of students within the classroom when in class or even in the period of examination; this assessment tool can identify what the students achieve when the teacher is in the progress of explaining the lessons, if they easily absorb the information given to them and perform well in major examinations.This Interview Evaluation Templates can be yours by downloading the sample format which can help the evaluator of the class to see the lapse that the teacher and students have in the process of learningin school. This class evaluation can make the strategy for teaching improved and for the students to strive more to be able to pass a subject. This is a PDF document displaying an Excel spreadsheet filled with questions requiring objective answers, pertaining to the teaching quality, assignment work and the overall classroom ambience. Few introductory sentences and instructions can be mentioned in the space allotted for the same. This template is yet another simple and organized display of questions covering various aspects of a course with respect to administration, characteristics, instructor’s feedback and so on. The answers can be entered by assigning a mark in response to a question. 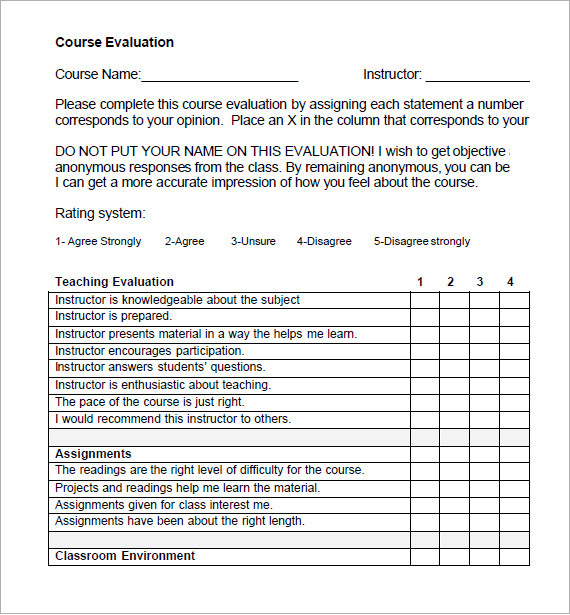 This template is used to print evaluation forms circulated among students, for gathering feedback on the course being taught. It features a table with questions on each row and subsequent columns for corresponding answers. A small box can be inserted for inputting the course/teacher code. This document gives a detailed version of an evaluation held among the students of an institution. Besides the usual tabulated questions, it also offers ample blank sections to be filled with the Course Title, Instructor’s name and ID, Date and elaborate explanation of answers reported. 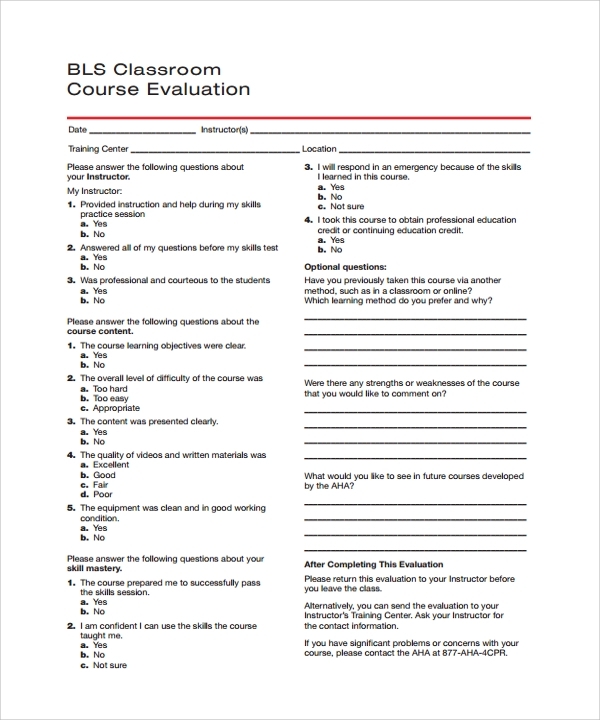 Who Can Use The Class Evaluation Template? Teachers can use this template for collecting opinions from each student of a class on their performance, skills and teaching quality. An administrative department of a school or college using this PDF document to conduct an evaluation survey among students regarding the courses being taught to them and on the instructors assigned for each course. Head of departments use such templates to generate a common questionnaire for staff and students on the overall it’s overall functioning. Accreditation bodies use this template to receive feedback of students about their school or college. In short this customizable template is used for collecting course and teacher feedback. 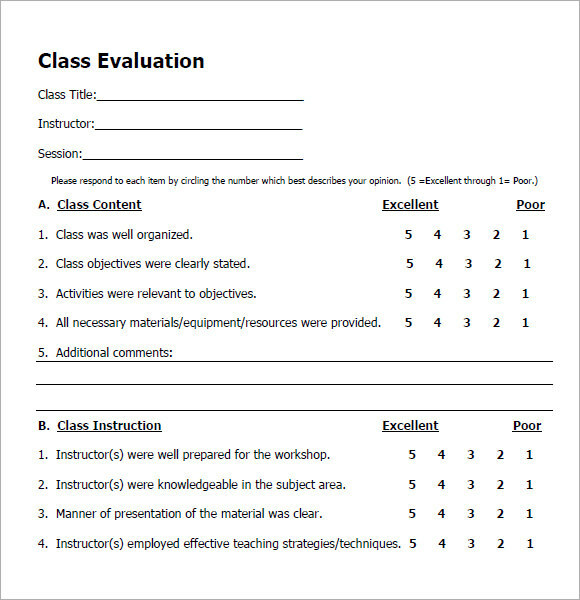 How To Use The Class Evaluation Template? The basic premade page can be availed by downloading a relevant template. Generally, this comprises some typical questions presented to students for their response on the classroom ambience, courses taught and teachers assigned. You can include additional questions that can be answered either in a subjective or objective manner. That is, insert enough blank lines to accommodate one lined answers or assign numbers to be selected as a mark of quality. Some evaluators employ this template to follow the conventional practice of using box or circle icons to be encircled in response to an inquiry. This template can be customized multiple times.You can also see Sample Project Evaluation Templates. 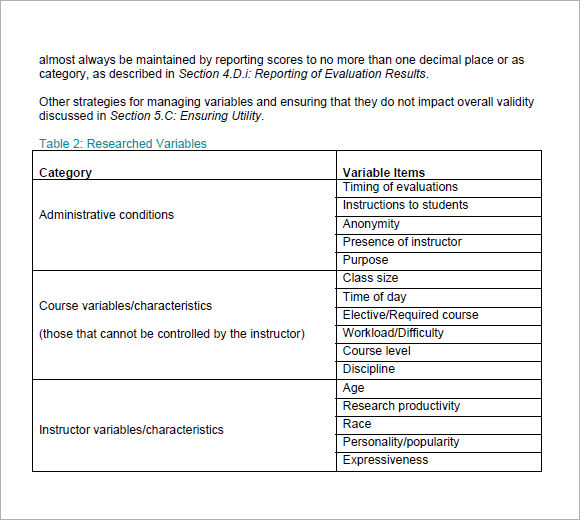 What Are The Benefits Of Using The Class Evaluation Template? The template is accessed using MS Word or Excel which are in built programs in any system. The file can be saved in PDF type which is again a frequently used application. 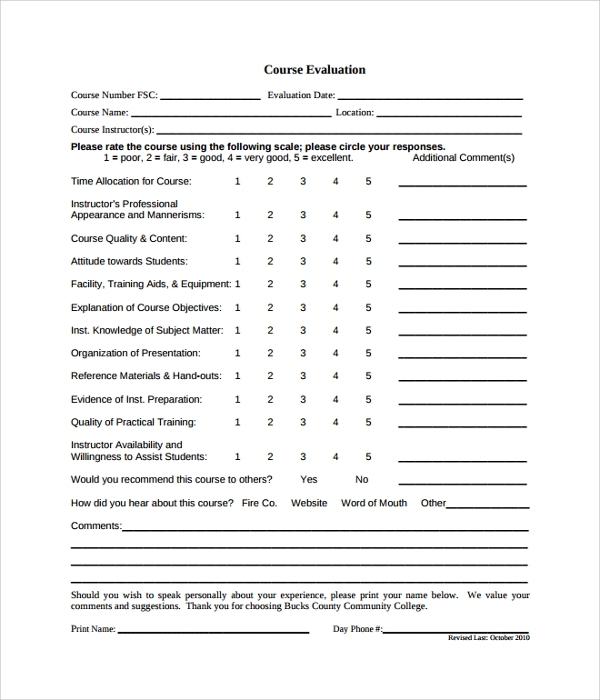 The content of this template is easily edited upon requirement depending upon the type of answers expected from students participating in an evaluation. Certain attributes which are in permanent use, such as ‘Teacher’s Name’. ‘Course Title’, ‘Date’, ‘Name of Institution’ can be retained while drafting new set of questions for an evaluation. Schools or colleges can insert logo at the top or as a background impression. Course Evaluation is a part and parcel of an academic year conducted once in two to three months. Instead of creating a new Word or Excel page each and every time, you can switch to this template which features the characteristic set of questions asked. Alongside, you can customize it according to your specifications. You can also see Performance Evaluation Samples.